Johansson (pictured earlier this month) has been on the books at Bayern since the summer of 2017. PROMISING YOUNGSTER RYAN Johansson has declared his commitment to the Republic of Ireland. Born in Luxembourg to a Swedish father and mother from Mullingar, the Bayern Munich midfielder is eligible to play for three nations. 17-year-old Johansson has represented both Sweden and Luxembourg at underage, but made his international debut for Ireland’s U19s in a friendly against Wales last September, before earning his second cap two days later in a win over the same opposition. The following month, the teenager was left out of Tom Mohan’s squad for U17 European Championship qualifiers against Bosnia-Herzegovina, the Faroe Islands and the Netherlands as he wished to consider his international future. Having only played competitely for Luxembourg so far, he is permitted to make one switch according to Fifa rules, but lining out in a competitive fixture for Ireland at any level would mean Johansson must represent them for the remainder of his career. The FAI hadn’t given up on a player of huge potential despite the fact he made two appearances for Luxembourg’s U21s in October — a 3-0 defeat to Montenegro and a 1-0 win over Bulgaria. And today, Johansson has “followed his heart” by contacting Mohan to inform him of his intention to commit to the Boys in Green. “He’s played for all three countries, but the best experience he had was with Ireland,” Ryan’s mother Christine told The42. “He wanted to make the decision around his 18th birthday. There was no pressure from either myself or his father, it was Ryan’s decision. Coincidentally, Stephen Kenny’s U21s face both Luxembourg and Sweden in the Eurpean Championship qualifiers, which begin in March. Johansson joined Bayern from French side Metz in the summer of 2017 and made his first-team debut for the German giants in a friendly win over Paris Saint-Germain last August, and followed that up with game-time against Juventus and Manchester City on the same pre-season US tour. This season, the teenager has featured in nine of their 14 U19 Bundesliga games, while he has also played four times in the Uefa Youth League. The FAI were unavailable to comment at the time of writing. Email “'His heart is with Ireland' - Bayern Munich teenager Johansson commits international future ”. 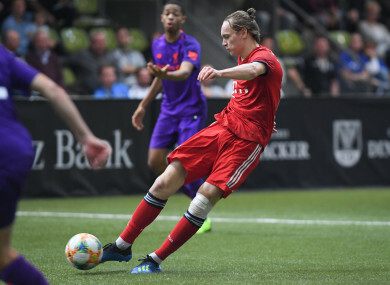 Feedback on “'His heart is with Ireland' - Bayern Munich teenager Johansson commits international future ”.